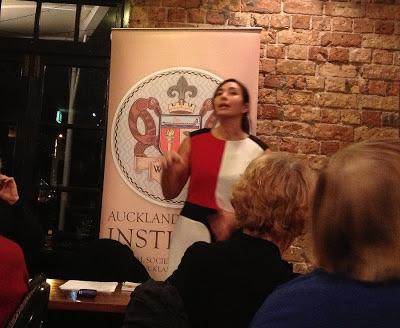 Notes: Cafe Scientifique: Waiter! There's nanotechnology in my soup! Wow! What a young, passionate, inspiring and knowledgeable speaker! I was not sure about spending my evening at the bottom of the Horse and Trap pub, but it was roughly on the way home, and Auckland Museum's Cafe Scientifique page suggested that there would be food mentioned. 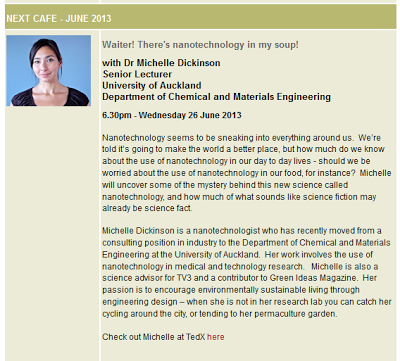 Dr Michelle Dickinson, who runs New Zealand's only nanomechanical testing laboratory at Auckland University's Department of Chemical and Materials Engineering, did not disappoint, sharing how nanotechnology, although we may think of it as "futuristic", is actually very much present in our lives, for good or for bad. Dr Michelle Dickinson in action. Fortunately, the talk did not begin absolutely on time, so even though I got off at the wrong bus stop and was running late, I was able to admire the beautiful venue with exposed brick walls and wooden counters, and order some snacks for dinner as well, before the presentation started. Surprisingly delicious vegies (brocollini, bak choy and green beans with black and white sesame), and crispy brocolli and cheese balls with beetroot relish. You know how wide a metre is, right? A nanometre (nm) is one-billionth of that in American English, i.e. 1nm = 10-9 m. As Michelle points out in her TEDxAuckland speech, to put this into context, one strand of your hair is 80,000nm wide. And nanotechnology is the science of matter with a dimension of 100nm or less. So she is constantly working with material that cannot be seen. Nanotechnology has a wide variety of applications, from cosmetics, to nutrition, to electronics, to solar panels. Like all things, it can enhance human lives or harm them, depending on the purpose for which it is used. Michelle's research has been in the field of medicine. You can make nanoparticles that deliver a substance to cancer cells, which allow you to then take an image of the patient's body and see where the cancer sites are. This material will heat up if you use a certain kind of light on it, so you can selectively kill off the cancer cells. This is a much better approach than chemotherapy, where you basically try to destroy the cancer before you kill the patient. Outside of the research lab, you can already find silver nanoparticles in Samsing washing machines, used for their antibacterial properties. However, what happens when those particles are washed down the drain? They could end up killing microorganisms in our environment, including those that are beneficial. Remember how sunscreen used to leave white streaks on your face 20 years ago? The reason you do not see it today, after smoothing the cream onto your skin, is that the zinc oxide and titanium dioxide particles have been reduced from micro- to nano-sized. The speaker even found "nano soap" being sold at Pak 'N' Save for $4.99, though who knows what it is made of or how it works. What are the properties of nanoparticles? It turns out that when you reduce something down to tinier than tiny, they start behaving in very different ways. A sheet of glass will shatter if you drop it onto the floor, but a nano-sized piece of glass would simply bounce. Gold is useful for its non-reactive properties, but a gold nanoparticle is highly reactive. This is due to the high surface area to volume ratio. What benefits could there be? Apart from treating cancer, nanotechnology could be used in food. For instance, if you had very fine particles of salt, you could cook a tasty dinner while using lower amount of it. You could create mayonnaise with much less oil by reducing the size of the oil particles, thereby making your meal somewhat healthier. Do you have a child who refuses to eat vegies? Companies have already produced a vitamin spray which you can point at their tongue. Tasting of blueberries, the vitamin nanoparticles are absorbed quickly into the blood stream. There are other advantages too. You can buy razor blades which give you "a closer shave", because they are coated with 4nm wide diamonds. Nanotechnology also allows us to make smaller electronics, smaller sensors which can be used to diagnose. Nanotechonology is used in everyday products, and little research has been done on what effects this may have on the environment or on human health. Of particular concern is the use of fullerine or carbon 60 nanoparticles in some cosmetics. Also known as "buckyballs", they are supposed to have "anti-aging" properties. However, they have displayed toxicity in mice, and more independent research, done by those not driven by an agenda, is needed. Amazingly, nano silver is also used to coat baby bottles to kill germs, even though we do not know whether it could harm people, and young infants are amongst the most vulnerable. Although nanotechnology sounds like something from the future, it is already being used all around us. Further research is required to determine how safe it is, and consumers should be pushing for legislation so they can make an informed choice on the products that they buy. Studies done so far have either been funded by corporate interests, showing positive results, or by the opposite camp, showing negative results, but using unrealistically high levels of nanoparticles. We still do not know the their effect at expected levels. Some companies are proactive about disclosing their use of nanomaterials. For instance, Blistex has notified the EPA it uses nano silicon dioxode in its lip ointments. However, there is no requirement to do so until 2015, when labelling will be mandatory in cosmetics, though not in food. Nanotechnology has the power to do great good, but it can also have a dark side. We need to put processes in place to ensure its safety, and channel funding towards research on health and environmental impacts, not just encourage business-driven goals such as the development of faster computers or other products. Promotional description of the presentation on Cafe Scientifique page. The main presentation was a great overview of nanotechnology in our lives, but the audience had some excellent questions which made the evening all the more interesting. I have tried to paraphrase them below. Why have we not seen nanotechnology used to treat cancer? Animals with stage 4 cancer, from dogs to horses, were donated for our research in the States. Our cancer treatment is very non-invasive. Basically, after sending the nanoparticles through, you just shine a lightbox on the animal, and we have had a 100% success rate (on 28 animals?). There was only one that died, and that was due to another reason. However, the nanoparticles do not leave the body afterwards. They collect in the liver and we cannot prove that they will not harm you in some way in the future, even though none of the animals we tested showed any signs of being the worse for it. There has been no testing on humans, because the FDA will not approve a treatment in which something introduced to the body accumulates in it, even though the person may be in better health than before treatment. How do you produce and collect nanoparticles? We use our knowledge of chemistry to move atoms to where we want them to go. Another way of producing nanoparticles is to use a high powered laser, breaking the material up into tiny fragments. We hold them simply in the usual containers, even though the nanoparticles will be oozing through the pores of the container. They are produced in such quantities that it does not matter if some are lost. Of course, they are not really lost. We just can't see them. Work has been done to electrospin nano fibres to weave filters for nanoparticles. Nano fibres are actually cheap to make, and there is a startup making filters with them for heat pumps. But collecting nanoparticles is the easy part. The hard part is to work out how to let water molecules through at the same time. Other research has looked at capturing nanomaterial chemically as well as physically. Do nanoparticles exist in nature? Yes, our bodies contain organic nanoparticles. The main concerns have been with the use of inorganic ones. Will nanoparticles break down over time? Some will and some won't. For instance, zip-lock bags have nano silicates which are antimicrobial, and these will break down over time. However, nano silver and gold do not break down. Genetic modification (GM) is highly politicised. Why is the same not true of nanotechnology? Perhaps the nanotechnologists saw what happened to GE and are careful to keep it quiet. Certainly there is less public awareness of the prevalence of nanotechnology in our lives. This may be due to the fact that companies are not required to disclose their use of it. That is why I think labelling legislation is very important as a first step. Would you say that nanotechnology is well developed already, since it is already used in so many different ways? It is widely used, but in terms of understanding its health impacts, it is still at its infancy. I inspected a Chinese factory recently, in which electronics with nanotechnology were produced. The workers were walking around with dust masks, thinking they were well protected! There were no safety protocols in place. The problem is that it is easy to get funding to make faster computers, but ideally, we want to have money set aside to research the implications of this on our health and environment too. There are ways to destroy GM material. You can burn it, or pour bleach on it, but there is no equivalent in nanotechnology. Gut instinct is your only control. I will never work with, or allow my students to work with, something that I think might be dangerous, even if it promises lots of funding. For instance, I would say no to testing lead nanoparticles. Others are not as fortunate as me. Chinese researchers are pressured to publish every year, and get forced to do research they do not want. Like radioactivity, nanotechnology is hard to see and test. What are your plans? What will you be doing for the next year or so? I am a failure engineer. I like to pull, push and squash things at a nano level. I want to break malarial cells and see how they compare with normal red blood cells. If we can measure the difference between a disease state and regular living cells, we can learn more about conditions such as tuberculosis or Alzheimer's and work towards treating them. 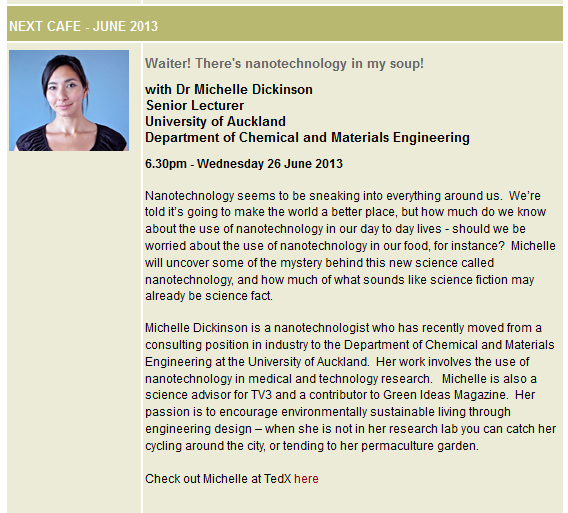 If you would like to hear Dr Michelle Dickinson speak in person, she will be giving a short presentation at the Auckland Girl Geek Dinner next Tuesday 2 July 2013. Don't worry: men are also welcome! Great report. There is a MBIE programme looking at Sustainable Decision Making for Future Foods. One of the technologies the researchers obtained feedback on was nanotechnology. Nano silver is not well understood, and certainly there is no longterm study about effects on cell and the environment. There is discussion about food labelling, and something that FSANZ is looking into, but only for novel foods (their definition is anything less than 100nm). It's a brave new world for sure. Thanks for the info! Glad to hear that there has been some thought going into this, though I think the public is largely still unaware of how nanotechnology is being used around us.